Cespar (also spelled Caspar) is a large island off the western coast of Hammerfell, south of Herne. Tralan the Two-Blade, a Redguard swordsman who became one of Emperor Titus Mede I's most valued men, hailed from Cespar. By the late Third Era, the island appeared to be considered part of High Rock in certain maps. 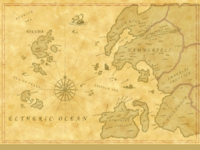 The alternate spelling Caspar is seen on the map of West Tamriel, but the island is later called Cespar in The Infernal City. This page was last modified on 28 November 2018, at 07:17.